This past weekend, Z Space welcomed Hope Mohr Dance for its fifth anniversary season. And over the coming week, the company will embark on its first tour ever, traveling up to the Pacific Northwest (March 29th & 30th in Seattle; April 1st in Portland). In anticipation of and in preparation for this monumental event, the spring program included the premiere of "Reluctant Light" and 2011's "Plainsong". 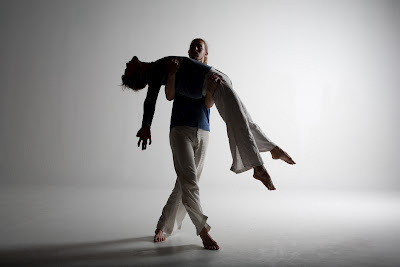 Dualism is an imperative concept in today's contemporary choreography and both "Reluctant Light" and "Plainsong" revealed a study of opposing forces. "Reluctant Light" is a highly textured work, a layering of ideas; in both its narrative content and its structural form. The opening scene found a group of different sized box-like structures strewn across the performance space. These skeletal shapes had no sides or tops, just the external 'bones', affording them both boundaried and boundary-less characteristics at the same time. On one hand, the dancers walked through, rolled through and stood inside of these set pieces, challenging their assumed barriers. While at other moments, they respected the imaginary surfaces - rond de jambing legs over the top of a box, drawing arms around the nonexistent sides. With "Reluctant Light", Mohr has succeeded in blurring the lines between perception (encasement) and reality (freedom). Mohr's choreographic style also speaks to unexpected combinations; she employs contact improvisation supports, suspension and release and I even saw some turned out pirouettes and a playful pas de chat. The company's second dance, 2011's "Plainsong", was a rare and wonderful opportunity to see Mohr herself in a solo performance. This piece also had a visually captivating set: a volleyball net-like structure created by red wool, all at different points of existence - some frayed single strands, some woven into patterns, some partially completed knitting. Two steel poles completed the set and the same red wool was attached to them during the work, creating a square-like capsule. Again, the modern duality was present in "Plainsong" with a sense of deliberate purpose juxtaposed against a frustration in task. The movement style was equally compelling. It had a strength of attack and a delightful edge, almost as if Mohr had perched the choreography precariously on a fence. The audience remained in a constant state of the unknown - will the dance spiral into a frenetic craze or will it resolve into an observed calm? As part of Mohr's Bridge Project, the company has also shared their San Francisco spring performances with a featured guest choreographer/guest dance company over the past few years. This unique program holds a two-part vision - first, a deep commitment to the support of emerging dancemakers and second, the introduction of their work to Bay Area audiences. This year gave us New York's Dušan Týnek Dance Theatre. Dušan Týnek Dance Theatre's "Base Pairs" and "Transparent Walls", both from 2010, rounded out the evening as the guest company offerings. Týnek's extensive Cunningham training definitely informs and inspires his choreography, yet he has also developed a very independent and individual method of movement. His is a very technical and accessible type of modern dance with long limbs, lines and extensions. "Base Pairs" was scored to recorded text and a live ticking metronome; a theme of rhythmical accuracy. Though there was a strong focus on creating shapes in space, it was by no means stop-and-go movement - it was clearly not about static positions. In fact, what I saw was a constant rebounding of physicality from place to place - beautiful constant motion. "Transparent Walls" had Týnek's signature esthetic (love the saggital tilts) though this work also incorporated more dynamic range; shifting from stillness to slow adagio sequences all the way to brisk, feisty allegros. Roderick Murray's lighting design was incredibly cool. By hanging an old-fashioned 'footlight' strip high upstage, the back wall was completely erased. The dancers emerged from the darkness, moving forward, already in the midst of their choreography. "Transparent Walls" had absolutely no borders and no containment.